I only made one Christmas gift this year and I have to admit it was hard to give away! 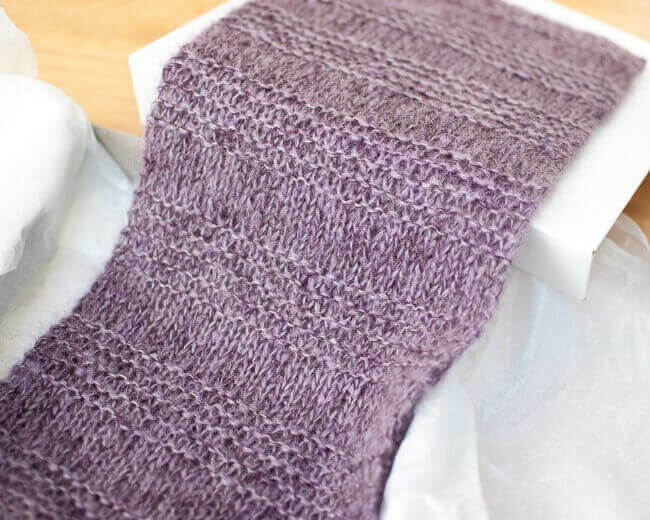 This knit scarf came out so soft and luxurious that I absolutely fell in love with it … but I made it with my mom in mind and I love her more, so I lovingly wrapped it up and waited excitedly for Christmas when I could give it to her. I am happy to say that she loves it too! I used a yummy yarn from my local yarn shop called Shibui Silk Cloud and it was absolutely divine to work with! It gives off a beautiful and soft halo too. I bought 3 hanks, 2 in a deep purple color they called Velvet and 1 in a more muted color called Mineral. I knit with all three at the same time to get a nice depth and color variation. 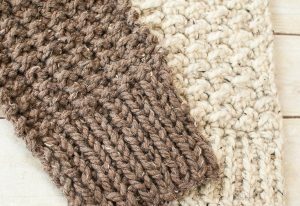 Hope you enjoy this knit scarf pattern too! 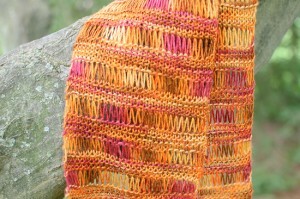 Add this pattern to your Ravelry library here. Finished scarf measures approx 7¼ in. wide × 56 in. long. Knitting with all three strands together, cast on 30 sts. Rows 1 through 11: Knit. Repeat Rows 1 through 16 until scarf measures about 52 in. or 4 in. shorter than your desired length. End with 11 knit rows and bind off. Block scarf to size if desired (see post on How to Block Knit and Crochet for more information). Click here for more free knitting patterns here. Hi Kara….lovvvv this pattern…I am worried it would curl inward….does it..???? Do I us e all three yarns together to make the stitches? Beautiful! I can imagine being swaddled in all that softness!! Thank you for this pattern. It looks very nice and easy to knit ! Yes, it definitely is an easy one! I’m so happy to hear that. Thank you, Marilyn!